Petal flowered retro rubber swimming hats, vintage and fabric swim caps, bubble crepe, fashy swim caps, my swim neoprene caps for long hair. Browse our online shop by category to find the right swim cap for you. 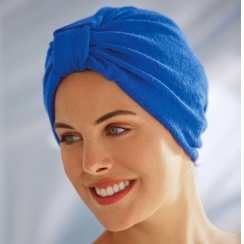 Make a beautiful splash at any pool or beach gathering in magnificent retro swim caps. Available in many different colours and interesting textures, there is sure to be a vintage swim cap that will go amazingly well with anything in anyone's wardrobe of beautiful and fashionable swimwear. It's so hard to choose between styles from fun and flirty three dimensional daisy designs to adorable bubble caps to stylish and chic turban styles. Any fashion forward trend setter will love to wear any of these retro swim caps. The choice is made even more difficult by the glorious selection of colors in these fun and functional swim caps. 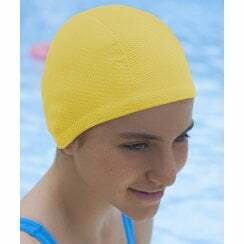 Keep hair dry, and free from the damaging effects of chlorine by using a beautiful swim cap when swimming in a pool, and keep hair clean when swimming at the beach by wearing a fun and functional swim cap. Be the sweetest fashion guru at the beach and the star of any pool in a fabulous flirty flowered swim cap. Flower petal swim caps have been featured in many world famous fashion magazines, which include Vogue, Teen People, and Marie Claire. Any day can be a fabulous day at the beach in distinctive and elegant retro swim caps. 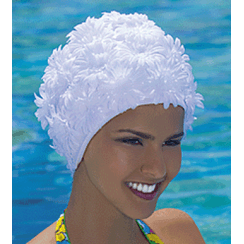 When putting on a fun and high fashion swim cap, be sure to stretch it a bit to keep from pulling hair. 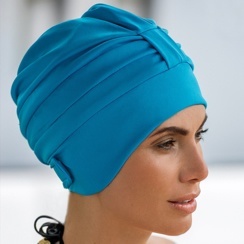 In virtually no time at all anyone will become an expert at putting on a gorgeous swim cap that is sure to help to keep hair from being damaged by sun, wind, chlorine, sand and other pool and beach elements. These were also worn in High School musical 2 at a swimming party.